Today was a bone marrow screening donor drive, hosted by Citrix Online for the City of Hope and Teddy Bear Cancer Foundation. The drive is in support of 2 and half year old Lexi, who has leukemia. Maybe you saw an article about this posted elsewhere. I was in the area, so I went to add my name to the National Marrow Donor Program Registry. So not only was I checking in my marrow as a possible donor to Lexi, but to anyone who may need a bone marrow transplant. So how was it? Really simple. First, I reviewed a short checklist of general qualifications. Such as: was I between the ages of 18-60? Was I willing to donate to any bone marrow patient in need? Did I have any back problems, and was I generally not obese? Second, I filled out a health questionaire that was similar and much shorter than the kind of health forms I see when I donate blood. And I provided contact information, and the contact information of two close family members of friends, in case my contact information changed and then the Registry folks could contact them to figure out where I was. Third, I was given four swabs to rub inside my mouth on my cheeks for 5-10 seconds to collect cheek cells which would be used to determine my tissue type. 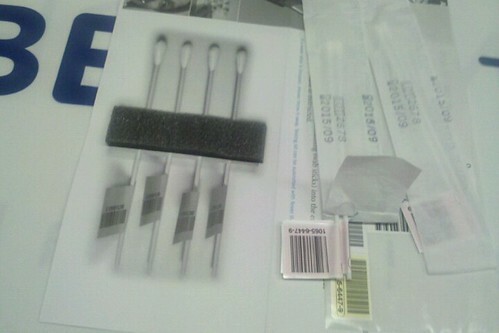 Two swabs for each side of my mouth, upper part of my cheek and lower part of my cheek. Stick the swabs in an envelope and seal it. That's it! If there's a match between now and when I'm 61 years old, then there is a series of additional tests and then the actual donation by either PBSC (peripheral blood stem cells) that looks like doing an apherisis style blood donation, or a marrow donation where a needle is used to withdraw liquid bone marrow from the pelvic bone. But this was just a screening drive. Very easy and it may help someone like Lexi who is just two and a half years old, and that's too darn young to have leukemia and go through chemotherapy. I'm happy to note that this drive generated about 120 registrants, according to the lady overseeing the donor screening drive. I was in a conference room that held about 10 seats and people were in every chair filling out forms and swabbing their cheeks.